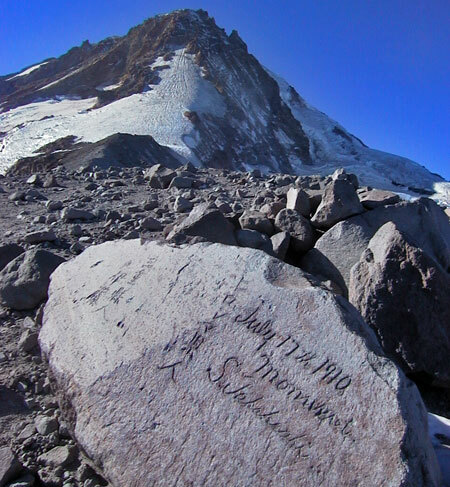 Today marks the centennial of a Japanese climbing expedition to the summit of Mount Hood on July 17, 1910. The achievement would probably be forgotten by now, except for the visitors carving a record of their ascent into a glacier-polished andesite boulder at the crest of Cooper Spur. The boulder is now informally known as “Hiroshima Rock”, and a familiar feature to generations of hikers and climbers who have since passed this spot. Little is recorded about the expedition, even in the gold standard of Mount Hood history — Jack Grauer’s Complete History of Mount Hood — though the arrival of a Japanese climbing expedition surely must have been reported in the local press of the time. Lacking that written history, what follows is my own speculation on the climb. The inscription contains both English and Japanese text, and supposedly the Japanese portion identifies the expedition as originating from Hiroshima. 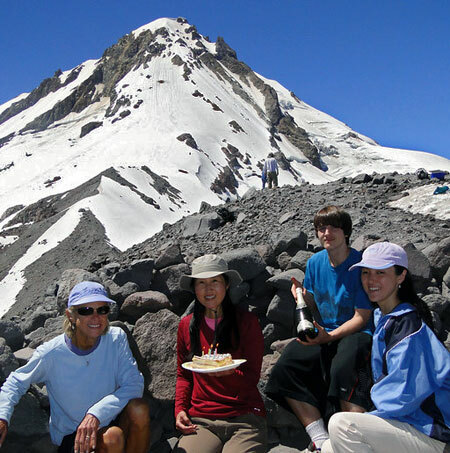 It is not surprising that a Japanese expedition would seek out Mount Hood. 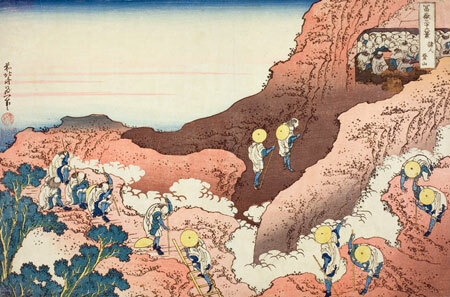 Mountain climbing had blossomed as a sport in Japan in the late 1800s, just as it had in Europe and the United States. But the Japanese interest in climbing mountains had deeper roots, dating back centuries to the earliest spiritual pilgrimages to mountain peaks — most notably, Fujiyama. 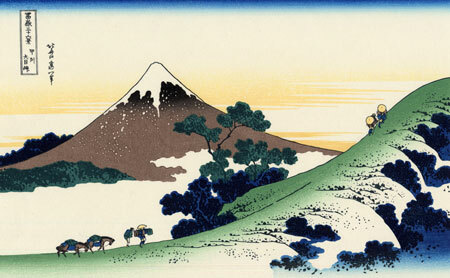 It is therefore not surprising that a group who had likely climbed Mount Fuji numerous times was drawn to Mount Hood, on the opposite side of the Pacific. Both peaks are part of the Pacific “Ring of Fire”, and share a common volcanic origin. Yet, Mount Hood would have been a more technical climb, with its steep, deeply eroded slopes and tumbling glaciers. It is also likely that the Japanese party stayed at Cloud Cap Inn, or at least stopped there, since the inn was still operating in 1910, under the management of Horace Mecklem, and would have likely been snow free in mid-July. At the time, the Cooper Spur route was the most popular ascent, since Cloud Cap Inn provided the best access to the mountain. Given the very active climbing schedule of the Mazamas in the early 1900s, it is also likely that the Mazamas were involved in the Japanese expedition, or at least aware that a group from Japan was on the mountain. The Japanese expedition likely used similar climbing tools to what Europeans and Americans employed at the time: layered clothes, knapsacks and alpenstocks. 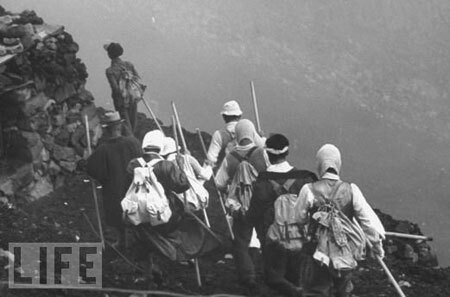 The photos below are LIFE archival images from the late 1940s that capture the look and feel of Japanese climbs just after the war. These images probably give a fair sense of what the 1910 climbers must have looked like. 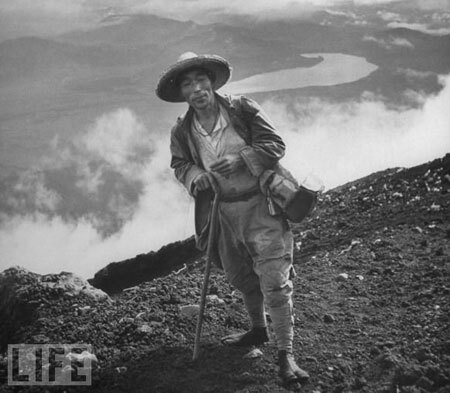 The second image from the LIFE series is interesting in that it shows the climber wearing traditional Japanese tabi, or toe shoes (see detailed view, below). Modern tabi are still widely worn today in Japan, and as anyone who hikes knows, modern toe shoes are a popular new trend in the U.S., too. 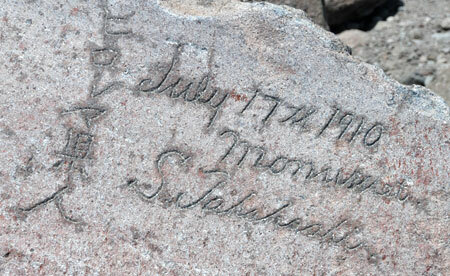 So, why did the expedition carve their record into the rock on Cooper Spur? The most obvious explanation is simply posterity, since it was common in that era to carve your legacy into rocks or trees in a way that we would find unacceptable today. But a more intriguing possibility might be that that expedition was holed up on Cooper Spur, perhaps stalled by bad weather, or simply setting up a base for the final ascent. This might explain the time it would have taken to chisel the Hiroshima Rock message into a very hard chunk of andesite — an effort that would likely take hours to complete. For now, the details appear to be lost in time. But the legacy of the inscription is an elegant reminder that attraction of Mount Hood drawn visitors from around the world from the very beginning, and still does.